Jeep finally released official pictures of the 2018 Jeep Wrangler we’ve been seeing in very mild camo for months and months now, but at least now we know officially what’s going to make it to the showrooms and muddy fields of America and what isn’t. Which means this is an ideal time to give some uncomfortably close attention to the indicators and taillights. I get that for most well-adjusted people, this seems like an unhealthy amount of focus on details, but I think in the case of the classic Jeep design, that’s not true. 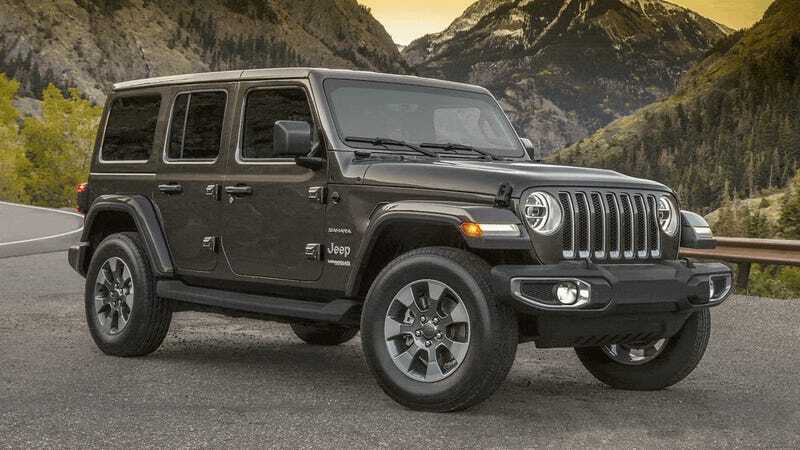 Because the Jeep Wrangler is so tied to a very specific, iconic Jeep look, that means the places where design changes and modernization can take place are remarkably limited compared to other cars. With the iconic Jeep, the styling details are incredibly important, and one of the few places where design flexibility can happen are in the taillights and turn indicators. It’s amazing to think how much is actually off-limits for change. The headlight shape, for example, was dramatically changed once, with the YJ in the 1980s, from round to rectangular, and there’s still purists fuming about that. Now, anything other than a round light is off the table, though Jeep is certainly playing with what’s inside that round boundary on the newest model. Turn indicators, though, might be the Jeep Wrangler design element with the most freedom. They started as simple round lights under the main headlamps, and continued that way until the YJ’s rectilinear heresy turned them square. Unlike the headlights, though, there really wasn’t an outcry about the square indicators, and they stayed square on the TJ, which returned the round headlamps, but moved the indicators to a new spot on the front of the fenders, and included a nice trapezoidal side marker lamp. No one freaked out, proving that the turn indicators may be the part of the iconic Jeep with the most freedom to change. The current JK returned the indicators to their classic round shape and location below the headlamps, and made the marker light round as well. Now, in the JL, we see the biggest indicator light change since the YJ, and the first additional set of lighting to the Jeep design probably since WWII blackout lights: the daytime running lights, or known as DRLs if you want to seem cool to lighting nerds, which no one does. The DRLs form horizontal strips on the leading edge of the fender, and terminate in a small, wrap-around amber reflector that also forms the side marker light. The DRLs certainly impose a more modern look on the Jeep. The DRL area must do double-duty as the turn indicator, since there’s no other visible turn signal area. Since most DRLs turn off when a turn indicator is on on their particular side, they may be using bi-color LEDs that will blink amber in that horizontal band when the turn indicator is on. That would gives a good-sized turn signal. I’m curious to see one in person and put a blinker on to see the magic happen. Perhaps the inner one is the DRL and the outer the indicator? I guess we’ll see. As for the taillights, Jeep has had three basic designs over the years, and it wasn’t until fairly recently that Jeep even used a custom taillight design at all—they may have been the last manufacturer to use a generic, trailer/truck-type lamp on a mainstream vehicle. The first civilian Jeeps just used basic, round rear lamps, later adding a small clear, round separate reversing light after 1968. Though, to be fair, our Jeep obsessive David just got on me about this over-simplification, and let me know that there are actually at least five variations of small, red, round taillight on old Jeep CJs. There’s a little chart there, if you’re curious. It also includes the word “Stimsonite” which is the stuff that takes away Stimsonman’s powers, if I recall. By the early 1970s, Jeep switched to the standard, iconic “box” taillight, a under-appreciated and brilliant bit of design that incorporated a taillamp, stop light, turn indicator, side marker lamp, reverse light, and license plate light all in one compact unit with only two bulbs. It’s used on trucks and trailers and forklifts and all kinds of things, as well as many, many Jeeps. By the JK era, that off-the-shelf taillight had become so tied to the Jeep look that when they designed a taillight specific to the Jeep Wrangler for the first time in its history, they just modernized and cleaned up the look of the old box taillamp. It’s sort of a strange idea, making a slightly-stylized version of a part you can pick up in any truck stop, but it sort of made sense, too. The latest version of the Wrangler seems to have made some decisions about what criteria are needed to make a true Jeep taillight, and we can infer those by comparing the new design to the past. It seems a Jeep taillight needs to be roughly rectangular, boxy, and mostly external, as in not integrated into the bodywork of the car, but stuck on the outside. The perimiter-reflector area has been maintained, but the overall shape is pinched in the middle by the bulky black side housing. The arrangement of the internal elements has changed, too, with the reverse light now central, likely to emphasize that pinch point. The new lights look sort of like the old ones as if they were somewhat soft and held in place by clamps. Maybe that gives them a bit of visual tension, instead of the static-looking box? The shape also is reminiscent of a cross-section of a girder, which perhaps conveys ideas of ruggedness and strength, two qualities Jeep very much wants Wranglers to express. The taillights are also supplemented by a pair of small reflectors or lights on the bumper, flanking the spare tire, and, of course, the CHMSL in its usual spot peeking above the spare. Overall, I think the biggest risks and changes Jeep is taking with the new Wrangler, aside from a vent or two here and there, are in the lighting design. From a distance, that’s how you’ll most quickly identify the new one from the old one, and I think overall they made some good choices. The front indicators and DRLs are perhaps the most obvious modern-looking design element, and one of the very few that doesn’t need to play off of some established iconic look. The result I think is successful, and manages to not look out of place. I’m hoping the DRL area acts as an indicator as well, but we’ll see. The taillights are in some ways more interesting, because they’re pushing an old design to some strange new boundaries, but managing to keep it as part of a recognizable lineage. Wrangler designers, along with maybe Porsche 911 designers, have some of the most rigorous constraints to work in, so it’s especially interesting to look at the little things, and see where they’re stealing their bits of freedom and flexibility. And now you just read a whole article about Jeep indicators and taillights. You’re the real hero, here. Jalopnik Hive Mind Project: Who Designed This Iconic Taillight?